So if the gun, the inanimate object, didn’t exist, there would be no violence? Irrational. I doubt hate would diminish if guns were banned, but at least it wouldn’t be such an open invitation to use your weapon any time you please. You wouldn’t believe the things they are making nowadays. Makes guns look like pieces of phony metals. I don’t wish to witness the outcome of modern nuclear warfare. It has the power to wipe out the whole of humanity. Without the hate the violence would not be perpetrated, which it so easily is with a gun to assist it. I think that was the intent of the post. If only it were that simple but I’m totally on board with the principle. 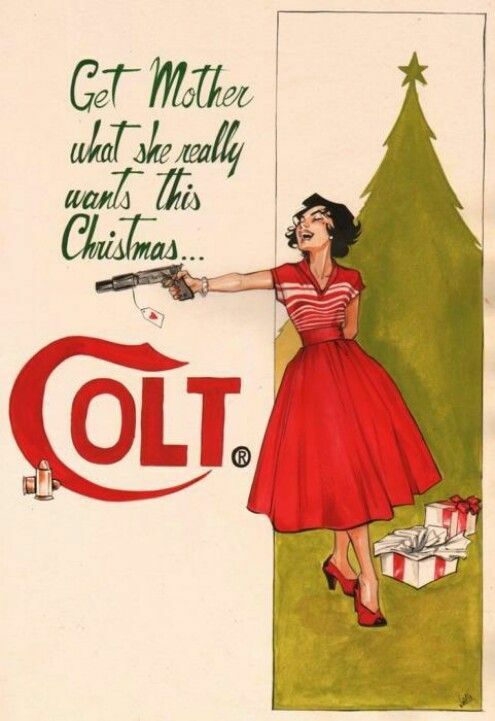 As for that Colt ad – I love it! And am slightly horrified by it. Very well put. That is an amazing picture. It is interesting that it looks like something from the 50’s. I guess our present situation has been evolving for a long time. Given the amount of irrational violence in the world, while not pursue unreason in its elimination? Nothing is inanimate. Case in point, notice how certain paintings “move” you. Ilona is right. Thank goodness no one ever bought my mother one. A perfect world….we do not have. You must have aged well. I think Plato “wrote” poets were the bane of civilization. Ahh, maybe he was right. Thank you. It’s all about what’s in the heart, not in the hand. The advertisement sells an emotion and creates a heightened need for the gun. It is this over consuming need used to sell mass produced products and lifestyles that is irrational. Build a society around such consumerism generates an exaggerated unbalanced set of social behaviour . Hate derives from fear and imbalance/insecurity. Hate acted upon generates violence. Inanimate objects become the tools for this violence. Whatever objects are most plentiful and effective become the most used tool. Aye, that would be nice. It is beautifully said. I like it. Thank you for following my blog. You have me as a follower also.